Hoodwink is the Biggest Con Job I've Played This Year. And That's a Good Thing. Slow jazz? Check. Disheveled office? Check. Intimations that someone will walk through the door at any moment? Check. All the signs of a classic film noir-inspired game are well in play. Except our detective seems awfully young. And grabby. And in fact not detective-like at all. Really, the whole opening of the game is a set-up: he'll con anyone, even the player. There's a reason the game's called Hoodwink. Our world-weary protagonist is Michael Bezzle, "acquisitions expert." And yet playing an actual thief doesn't feel all that different from playing a character in any other adventure game, to be honest; the genre has a way of playing fast and loose with any property that isn't nailed down. Every word from Michael's mouth is carefully placed, the vowels stretched out juuuuust enough to make him seem as if he might actually be laid-back, older, and burned out. But the art and the style of the game betray him: he is young and reckless, affecting a tone beyond his years. It could be annoying, but the game is funny enough to pull it off and make it work. Humor, in fact, is one of the two main assets Hoodwink has. All the narration, all of the character reactions, all of the observations are delivered with wry, dry sarcasm and perfect timing. Sinister Uni-Corp's advertising is particularly delightful, in kind of a Fallout sort of way. The other main asset of Hoodwink is its art. The world of Global-01 is gorgeous. It's wrecked and slummish and stunning. On high resolutions, every tile in its Asian-inspired mosaics shows and every shadow on its cel-shaded garbage holds multitudes. The studio behind the game, E-One, is based in Malaysia and it shows, with every environment showing a decidedly Asian approach to the city. The red lacquered non-wood is particularly nice. The play can be clunky. The interface is not necessarily intuitive and while "left click" really is the be-all, end-all, one-fit solution to every single circumstance the game has to offer, sometimes that's just not quite enough. Hitting escape does, as one would expect, bring up the in-game menu, but it doesn't actually pause any of the action going on behind that menu. I also couldn't find any way to skip over repeat dialogue. By the fourth drawer in a row that was "jammed," with an unskippable two-sentence explanation about the shoddy materials from which it was constructed, I dearly missed that option. I also ran into an issue where after quitting the game, it forgot all of my settings and kept trying to run full-screen in 640x480. (Windows didn't like that.) But that happened once, as a seeming fluke, out of several starts and stops. But even with the flaws, the art and voice acting are delightfully fun, and the post-apocalyptic noir-ridiculous setting is one after my own heart. 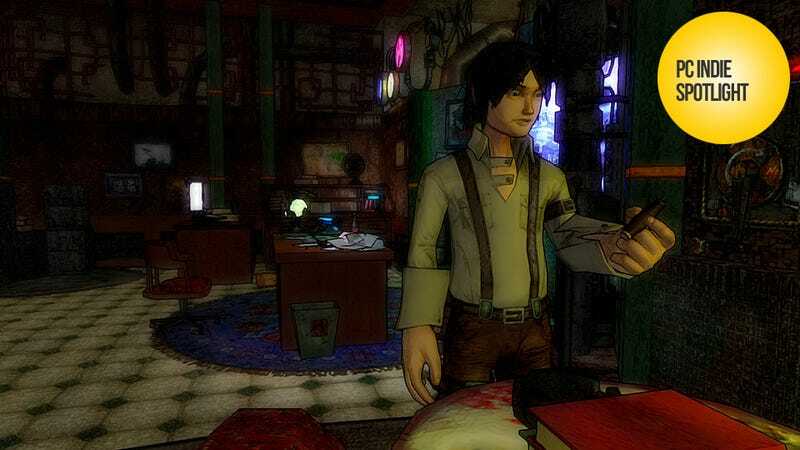 In the end, for an adventure game lover or anyone who doesn't mind poking some gentle, sideways fun at all the tropes and conventions from the long-gone era of Raymond Chandler, Hoodwink may be worth a look. Hoodwink is available for PC via Origin.